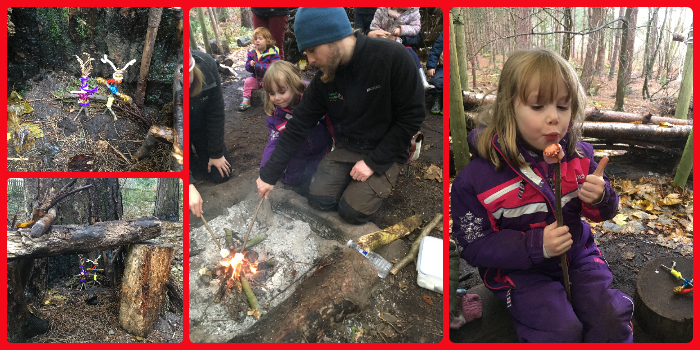 We enjoyed a fun morning of Stick Man activities with Forest Explorers in Delamere Forest! The session started with a book reading of The Stick Man (we'd also watched the film before setting out to get us in the mood!). The kids all knew the story well. Then each child was given a stick from which to build their own Stick Man. Each stick had legs so we ventured outside to find a suitable stick for arms and other materials to make hair, clothes etc. Using just pipe cleaners, the Stick Men were assembled. There was such a variety and they were so individual to each child. The next activity was making a wooden Santa. The children were given a carved wooden block, paint, glue, pompoms and googly eyes. It was so simple and yet it looks fab! Definitely a decoration we'll keep and have out each year. It was then time to venture outside again. This time deeper in to the woods to make the Stick Men (and women) a home. Miss A worked with another girl to create a house which then had a sofa and TV inside! The final activity was to roast marshmallows on the campfire. Miss A loves marshmallows so she was really excited to get to do this. It was nice that the kids had things to take home at the end of the session based on a story that Miss A is really familiar with. 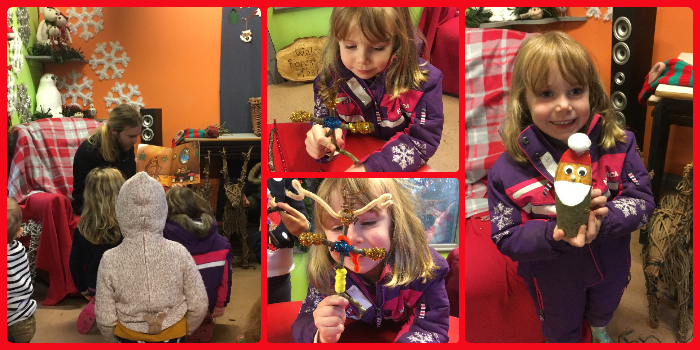 We've previously taken part in a Forest Fairies activity morning which was also really good. Forest Explorers host various family events in the school holidays so it's worth keeping an eye on their Facebook page for details.